Every football coach knows that tackling is one of the most important fundamental skills in the sport, yet few coaches know how to properly teach tackling. In this section, I cover some of the main reasons teams struggle with tackling, along with my thoughts on each issue. The offensive system should have the flexibility to adapt and be complementary to the athletes’ skills. If you are able to recruit players, target and secure players to fit your system. All good coaches put together a game plan for the upcoming opponent. Here are a few situations in which play calling and clock management directly relate to game planning. 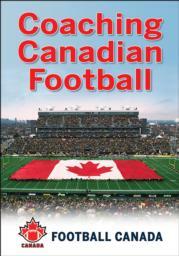 This book represents the collective knowledge and experience of Canadian football's most respected and renowned coaches, as selected by Football Canada, from all levels of the sport. Each coach shares personal insights, strategies, and advice, addressing all facets of the 12-player game. Being a successful football coach requires proficiency in the Xs and Os and the techniques and tactics of the game. It also requires the ability to manage off-the-field tasks critical to a well-organized, high-performing program. With Coaching Canadian Football, you’ll expand your knowledge of every aspect of coaching and emerge as a more complete and effective coach. Written by coaches for coaches, Coaching Canadian Football represents the collective knowledge and experience of Canadian football’s most respected and renowned coaches, as selected by Football Canada. Each coach shares personal insights, strategies, and advice, addressing all facets of the 12-player game. You’ll learn the inner workings of leadership and how to establish and convey your coaching philosophy. Chapters covering offense, defense, and special teams provide strategies and tactics for the running, passing, and kicking games on both sides of the ball. You’ll also find chapters addressing player safety, play calling, clock management, mental preparation, player evaluation, and opponent scouting. In addition, case studies and coaches’ personal perspectives demonstrate how to build and maintain successful high school and postsecondary programs. Featuring content that aligns with Football Canada’s long-term athlete development model and reflects National Coaching Certification Program (NCCP) guidelines, Coaching Canadian Football will make you a better coach by connecting you with innovative coaches and enduring principles that have shaped the game.